LiveReload uses TCP port 35729 to communicate with its browser extensions. This error means that another application on your computer has already taken this port. There is no need to completely remove them, just be sure to not run LiveReload 2 and those tools at the same time. If you use fast user switching, please keep in mind that only one user can run LiveReload at the same time. If it outputs nothing, then the port is unused. 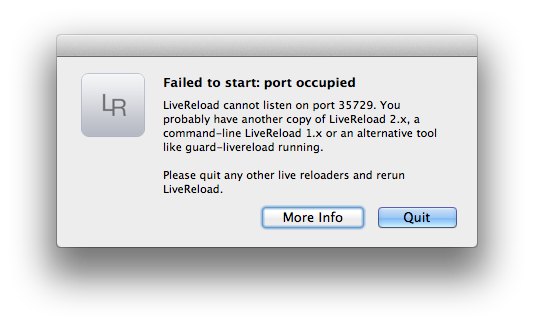 Otherwise, it gives you the name of the app which uses the port; if you quit that app, LiveReload should work (and the app will likely use another port the next time you run it). If that hasn’t resolved your problem, please open a new support ticket and we’ll help!